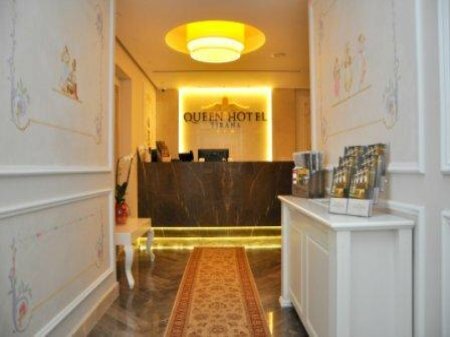 Hotel Queen is one of the newest hotels of the capital. Its location close to the Kristal Center, just a few meters above Unaza e Re, is a favorable position on the exit to the Rinas airport, and also to the shopping malls. Hotel Queen welcomes you in his paintings environments with murals. Each room is decorated with paintings of the european queens. The hotel offers comfort and high quality of service, all this with a competitive price. Queen Hotel has a capacity of 16 rooms: 5 singles, 6 twins and 5 double. All rooms are equipped with flat-screen TV, minibar, private bathroom with shower, hairdryer, free parking for customers, wireless internet, continental breakfast, and complimentary 24-hour taxi service in the city. The tranquility, privacy, cleanliness and service are the key to the success of this hotel.